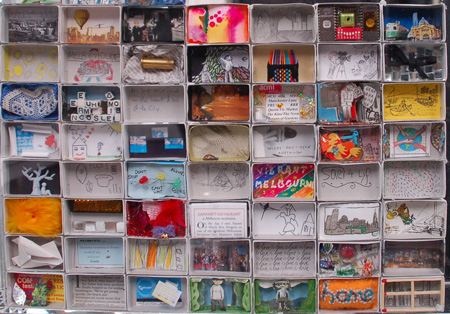 Thank you very much to all who have contributed to People Make Places: Melbourne via having your photo taken and/or�creating�your impression of Melbourne inside one of our matchboxes.� The matchboxes we have been receiving at Vitrine, Platform�are amazing. We�are having�a special viewing of People Make Places this Saturday�2 May 10.30am-12pm - the final day of our time at Vitrine, Platform.� On the day, we will be launching our photographs of Melbournians we have captured during our visits to Melbourne over the past few years. Vitrine is a large cabinet window space located under Flinders Street in Campbell Arcade (also known as Degraves Street Subway). The Arcade/subway connects to Flinders Street Station train platforms and can also be reached via stairs off Degraves & Flinders Streets. The closest exit to Vitrine is an underground staircase accessed from outside 248 Flinders St. Vitrine is at the bottom of these stairs (opposite the hairdresser). Vitrine is part of the Platform Artist Group, an amazing artist run initiative supported by artists, the City of Melbourne through the Arts & Culture Triennial Program 2009-2011, by the Victorian Government through Arts Victoria Programming, and by the Australian Government through the Australia Council, its arts funding and advisory body. 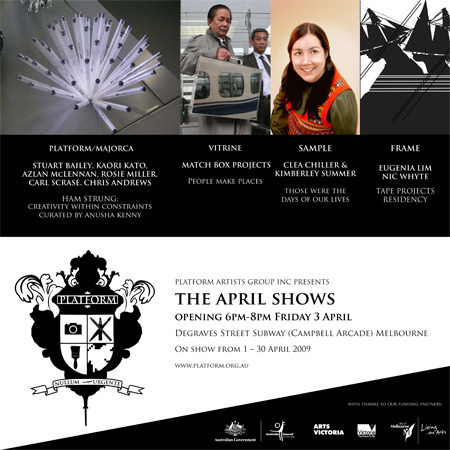 We are currently installing our latest project at the Vitrine Platform, Degraves St exit of Flinders St Station.� The opening is this Friday night - if you are in Melbourne please stop by.� We will be here for about a month creating a portrait of Melbourne.